This weblog entry builds on my 1999 article, " The Road to Damascus: What Netanyahu almost gave away," adding new pieces of information as they become available on the topic of the Lauder-Nader round of negotiations between Israel and Syria in August-September 1998. Before he was killed, Yitzhak Rabin had given me a commitment to withdraw from the Golan to the June 4, 1967, borders as long as Israel's concerns were satisfied. The commitment was given on the condition that I keep it "in my pocket" until it could be formally presented to Syria in the context of a complete solution. After Yitzhak's death, Shimon Peres reaffirmed the pocket commitment, and on this basis we had sponsored talks between the Syrians and the Israelis in 1996 at Wye River. Peres wanted me to sign a security treaty with Israel if it gave up the Golan, an idea that was suggested to me later by Netanyahu and would be advanced again by [Ehud] Barak. I had told them I was willing to do it. This vague statement ("gave up the Golan" can mean many things) has prompted several reactions in Israel. June 24, 2004 update: Ha'aretz today quotes Lauder saying in April 2001 the draft expressed only his personal view, and that the agreement was rejected by Netanyahu, who wanted a border that would give Israel more than either the 1923 border or the June 4, 1967, lines. Uri Saguy, Barak's chief Syria negotiator, has confirmed that Netanyahu agreed to withdraw to the June 4, 1967 lines, i.e., to the water line of the Sea of Galilee. Saguy says that when he took on the task of coordinating negotiations with Syria, he read up on previous negotiations under four governments – those of Rabin, Peres, Netanyahu and Barak. Anyone with eyes in his head, not to mention the Syrians, could have understood that all of the Israeli leaders were willing to leave all of the Golan Heights if satisfied in the realms of security, water, normalization, and also regarding a settlement in Lebanon." By reading these documents, I learned that if I were a Syrian, I would understand from the proposal brought by [negotiator for Israel, Ronald] Lauder that if Israel can be satisfied regarding all of the abovementioned points, it would be willing to withdraw to the June 4, 1967, lines. June 27, 2004 update: Netanyahu has rejected Clinton's assertion. "I never agreed to withdraw from the Golan Heights in any situation or in any talks," he said in one radio interview. "The negotiations were unsuccessful because I insisted that the final international border be located miles eastward of the current border." In another radio interview, he repeated this with a few more details: "In no situation did I agree to leave the Golan. That's what caused the break-up of the negotiations. ... I agreed only to make concessions in the Golan - concessions that were defined as setting the border 'kilometers' from the Kinneret (Sea of Galilee) - or, to be exact, 'miles.' That's what we wrote there." Ehud Barak, Netanyahu's successor, also rejected Clinton's account: "Netanyahu did not speak of returning to the international border line, rather a line that would leave a strip up to two miles wide." Comment: I outlined the two sides of this dispute in my July 1999 article and by all measures, they are still very much locked in place. July 4, 2004 update: Ronald Lauder issued a statement, quoted in full in today's Yedi'ot Aharonot, in which he states that "Prime Minister Netanyahu never approved a retreat to 1967 borders," adding that "None of the documents that were drafted during these talks was official, and no document was approved by Prime Minister Netanyahu." 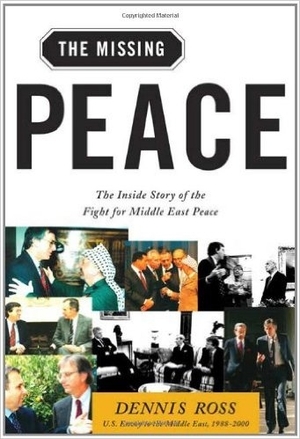 July 9, 2004 update: Dennis Ross' memoir, The Missing Peace: The Inside Story of the Fight for Middle East Peace (Farrar Straus Giroux) has just reached me, and he confirms on pp. 527-28 that Netanyahu had promised to return to the June 4 lines. 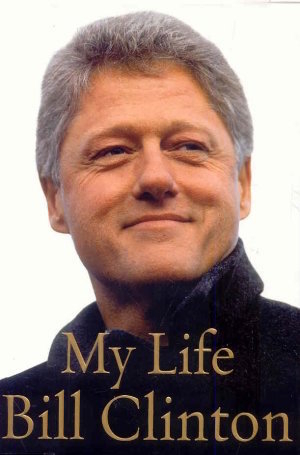 Specifically, he tells about Bill Clinton in September 1999 receiving from Ronald Lauder "an eight-point paper which he claimed included the final points that had been agreed upon by both sides in 1998" and it indicated an agreement by Netanyahu for a "withdrawal to a commonly agreed border based on the June 4, 1967 lines." Ross notes with irony that this "meant that Barak's position on peace with Syria was less forthcoming than Netanyahu's." Aug. 6, 2004 update: I provide a fuller analysis today of The Missing Peace at "[Dennis Ross on] Strange Twists in Syrian-Israeli Diplomacy." Apr. 24, 2008 update: With the Olmert government reportedly willing to turn the Golan Heights over to Syria, what Binyamin Netanyahu, now the leader of the opposition, did in 1998 has reappeared as a political issue. Today, the Jerusalem Post reports, Major General Ze'ev Livne (res), Netanyahu's military attaché, told Israel's Army Radio that Netanyahu "was willing to make prodigious concessions in order to seal a peace deal, but it was unsuccessful and was unrealized." Livne added his hope that such a deal "is realized in the future." Apr. 27, 2008 update: Netanyahu and Olmert traded attacks on the incipient diplomacy. In response to reports that Olmert had indicated to Bashar al-Assad that he would withdraw Israeli control from the Golan Heights, Netanyahu said that "The Golan must stay in our hands, because if we withdraw, we will receive Iran on our northern border. ... I am very surprised that the prime minister is willing to give up the entire Golan Heights, even before negotiations have begun, in such an amateurish, reckless way. ... This is not how you build peace." 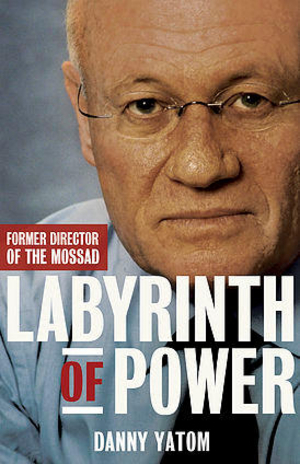 Olmert's office replied: "In order to refresh Mr. Netanyahu's memory, he was the one [who] sent then-Syrian President Hafez Assad an American businessman [Ronald Lauder] to relinquish the Golan Heights in Israel's name, before any negotiations had begun." To which Netanyahu's his office replied that "despite Olmert's attempts to mislead the public, Netanyahu insisted on keeping the Golan Heights, and that was why the talks were stopped." May 22, 2008 update: As debate over the Golan Heights heats up in Israel, news accounts quoted Likud Party faction chairman Gideon Sa'ar saying that if Netanyahu wins the next election, he would not be obligated by any agreements reached by Ehud Olmert with Damascus. To this, Netanyahu replied otherwise, that he would abide by such an agreement. At the same time, his office released a statement predicting that if Olmert does sign a deal with Damascus, the Knesset and the public will overwhelmingly reject it. Netanyahu expressed his own opposition to such a deal, saying that Syria is "an inseparable part of the axis of evil." Conceding the Golan, he maintained, would allow Iran to endanger all of Israel. "If you believe the Syrian Foreign Minister Walid Mualem that Olmert has already promised to give up the Golan up to the banks of the Galilee before the negotiations have begun, it is unprecedented diplomatic and security abandonment." In an interview, Netanyahu added that he does not rule out negotiating with Damascus, but he ruled out retreating from the Golan Heights. There is wide agreement from Right to Left that the diplomatic process cannot be used to shelter politicians in distress. Most of the public knows the prime minister expedited the talks with Syria and set the exact time for revealing them to distract the public from the investigations against him. Olmert, who is up to his neck in investigations, has no moral or public mandate to conduct fateful negotiations on Israel's future. Feb. 22, 2009 update: In an article on Netanyahu's current policies toward Syria, Uzi Mahnaimi quotes him saying in a 2007 interview: "Indeed I did have negotiations with the Syrians. I told Assad I'd need Mount Hermon because I need radar to look towards Iran, and Assad gave up the mountain. I was surprised and happy." In the vaults of the Prime Minister's office we found two documents that were used by Lauder. 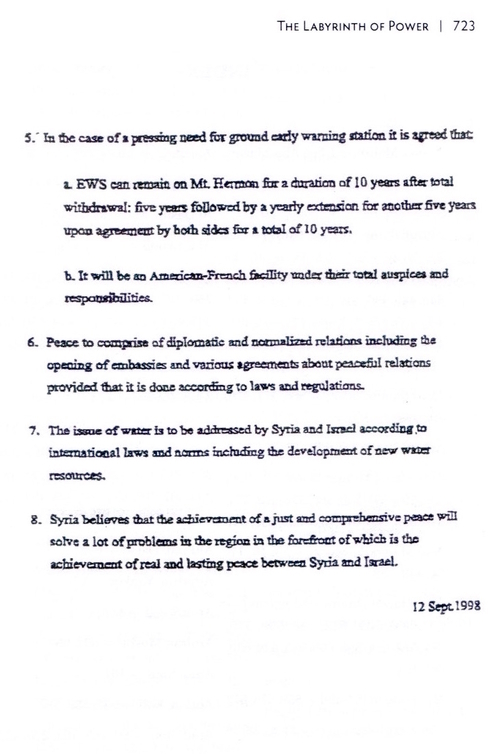 One was written by him on August 25, 1998, and included discussion points Lauder had used with Assad, and the other was from September 29, 1998, and was a list of ten provisions entitled "Peace Agreement between Israel and Syria." From the information that came to us, we learned that under Lauder's initiative, Netanyahu had agreed to withdraw to the border as it was on June 4, 1967.
al-Sharaa said that Lauder had telephoned the Syrian ambassador to the United States Walid Muallem, and informed him that Netanyahu had authorized him to say that Israel would withdraw to the line of June 4, 1967 as part of a peace treaty. According to al-Sharaa, Lauder also added that he was willing to say these things to Assad as well, if the latter would agree to meet him - and on the basis of this statement, Lauder had come to Syria. Seale told us that Assad said to him, "Lauder met with me and stated Netanyahu's agreement to a full withdrawal to the line of June 4, 1967. However, Lauder said that Netanyahu would not be able to say these things out loud, because they were contrary to his election platform, based on which he was elected. To my astonishment," Assad continued, "I heard from Lauder that Netanyahu believes it is possible to reach an agreement with Syria within fifteen days, and that he wishes to announce a full agreement as early as possible, and surprise the entire world." Seale went on to quote Assad, who had said, "Lauder went on to talk about other matters, and I realized that a map is required to ensure that we are talking about the same thing. I asked Lauder that at our next meeting he bring a map from Netanyahu, on which should appear the outline of the June 4, 1967 line as Israel sees it. It was my understanding that Netanyahu was willing to give us this map, but this did not happen, so the talks were suspended." After the Lauder documents, which Netanyahu had authorized him to present to Assad, had come into our hands and confirmed everything that Seale had said, Clinton approached Lauder and invited him to a meeting in which he asked him to report on his contacts with the Syrians during Netanyahu's period. On November 12, 1999, Lauder wrote a letter to Clinton, in which he sought to clarify some matters after having reviewed his notes. In his letter, he stated that he was referring to a period of five meetings during the summer and fall of 1998. Lauder wrote that although great progress was made in the talks they had not been completed, because it was impossible to delineate the security zones between Syria and Israel as long as Syria did not receive an Israeli map on which the line of June 4, 1967 was marked. Lauder further wrote that in the meetings he had held with the Syrians, an agreement had been reached on some points, "I believe that these points still need to be finalized by defining the security zones on both sides of the border. These points were agreed to by both parties on September 12." 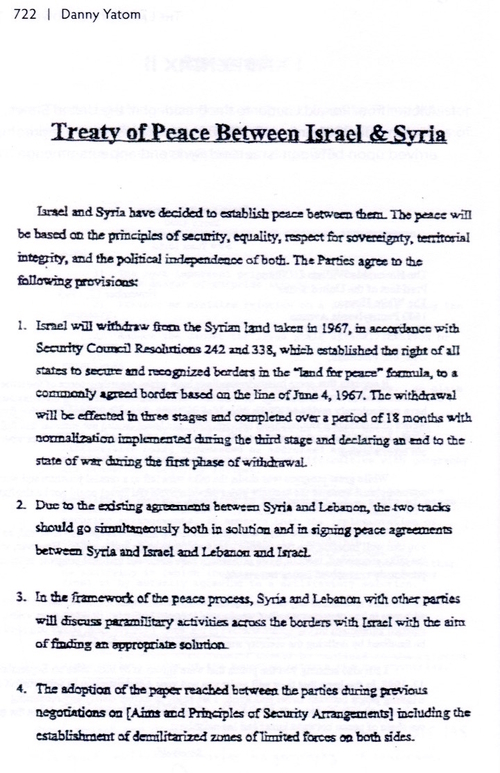 The letter then lists eight main points on which the parties had agreed: peaceful relations, Lebanon a separate track, deal with paramilitary activities, the creation of demilitarized zones on both sides of the border, permitting early warning stations, normalization of relations, water issues to be addressed, and regional impact. Netanyahu had told Assad that he was committed to withdraw to the line of June 4,1967. Ross noted that Netanyahu's statement was much more substantial than Rabin's, as Netanyahu had undertaken a commitment, while Rabin spoken in conditional terms – only if all conditions would be fulfilled, would he agree to a full withdrawal. Ross said he had heard this from two people: Walid Muallem, Syria's ambassador to Washington, told him that one day, Ron Lauder and Daniel Abraham (a Jewish-American businessman and millionaire) came to his office, asking to convey a message from Netanyahu to Assad. Muallem said to them that there was no point passing a message from Netanyahu to Assad unless Netanyahu would commit to withdraw to the line of June 1967. Eight months later, Daniel Abraham came to Muallem once again and said to him: I have received a commitment from Netanyahu to withdraw to the line of June 1967. Ross proceeded to tell us that the other source for Netanyahu's willingness to withdraw from the Golan was Miguel Moratinos, the European Union's special envoy to the Middle East. Moratinos updated Ross that Netanyahu had told him that he had committed to the Syrians to withdraw to the line of June 1967, and was working to prepare a paper that would ratify this. Lauder had had nine meetings in Damascus with Assad, and in their final meeting, Assad had demanded a map with Netanyahu's signature on it, upon which the line of June 4, 1967 would be marked – the line to which Israel undertakes to withdraw. lndyk added that Yitzhak Mordechai, who was then the Israeli Minister of Defense, had refused to give this map to the Syrians, because he was dissatisfied with the security arrangements. He also said that on his way to meet with Arafat in the Wye Plantation, Netanyahu had made a detour in his journey, specifically in order to meet with Lauder and give him a message to pass on to Muallem - to the effect that Netanyahu himself had been willing to give Assad the map, and that he had been willing to go to Damascus for this purpose, but Assad had refused the offer. from the documents and various reports we had received, it could be seen that in total contrast to his statements, and according to Lauder and others, Benjamin Netanyahu had been prepared to withdraw from the Golan to the line of June 4, 1967, and had even pledged to do so before the Syrians. Hence, when Mordechai told Netanyahu on live television that he had, in fact, promised the Syrians to withdraw from the Golan Heights, and Netanyahu denied it, Mordechai fixed his gaze at Netanyahu and said to him, "Look me in the eye!" At that point, both knew exactly what Mordechai was referring to. Whenever Barak said that three prime ministers had promised to withdraw from the Gola n Heights, including Netanyahu, he knew what he was talking about, and when Netanyahu responded that "nothing of the kind ever happened" - he was being inaccurate, to say the least. 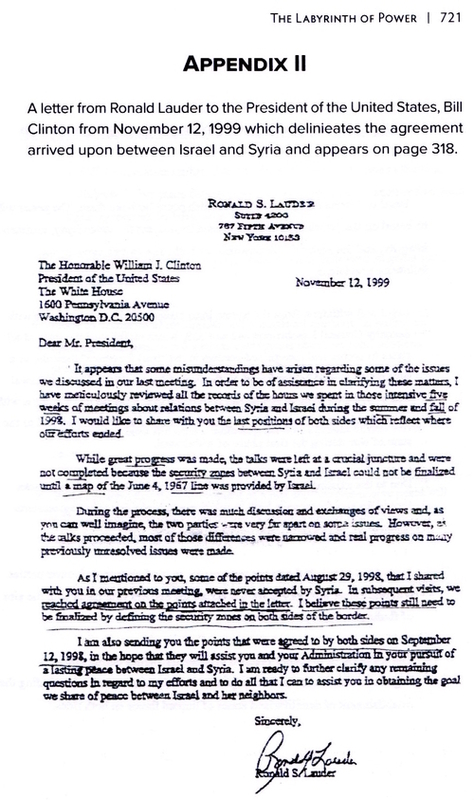 Yatom includes the Nov. 12, 1999 letter from Lauder to Clinton, with its appendix, which I reproduce here.